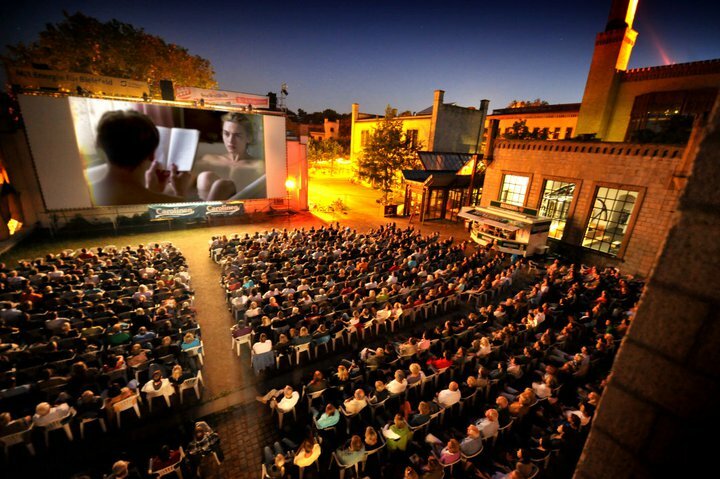 I was just looking at the schedule for the open air cinema in Ravensburger Park and there are some great movies this summer, starting July 14th and running through to September 1st. I don’t see the schedule on the website just yet but there are lots of brochures around in town. Inspired by Sam’s description of the ‘hobbit village’ in her post on Nordic walking trails, we went to investigate further. At the top of the steep path, leading up from Burger Park to the woods, we took a right onto a small road Sieben Hügel. We strolled along enjoying the forest on one side and great views across Bielefeld on the other. Sure enough we came across the little gardens and their cute garden sheds. They are what we would call allotments in England. Although in England they are used mainly for growing vegetable and here they are planted with flowers and the sheds are much bigger, almost tiny houses. They enjoy an amazing view across Bielefeld. We keep walking until we reached the café Gartenlokal Sieben Hügel (there’s a small sign), it’s an eclectic old fashioned place and easily reached from the forest too if you were hiking by. There is no set menu – the owner cooks whatever she feels like on the day. It’s a rather magical setting alongside the ‘hobbit village’. Thanks Sam for sharing your adventure and inspiring us to visit too! Der Koch is a cozy place to eat in the winter but in the summer the action moves outside to the Super Tram. Tables appear in the square and it’s a great place to get a drink or dinner on a warm evening. 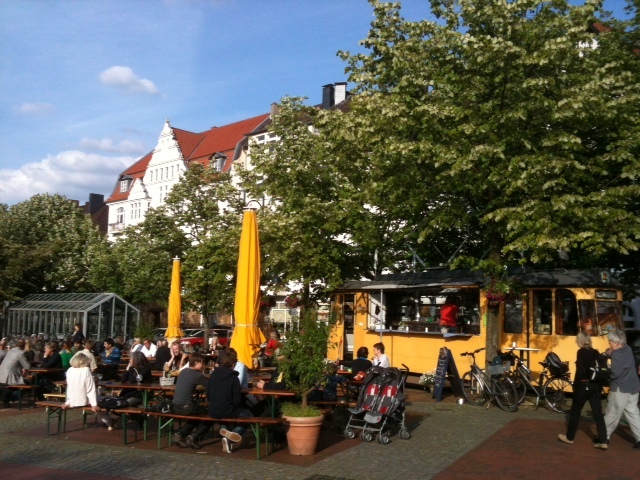 I love the sense of space and the fun atmosphere of Siegfriedplatz in these warmer summer months. Also the back room of Der Koch turns into an Eis cafe with delicious ice cream. Bielefeld is small enough to feel like one borough in another major city. Nevertheless, it still has distinctive areas with their own particular character. Being the particular nook of Bielefeld where I live, I would like to put my favourite Eateries on the map located in the East of the city, as well as the centre. 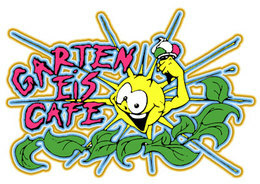 Garten Eis Cafe – a family run business serving homemade creations such as the “Bielefella” – a yoghurt ice cream with crocant and liquid chocolate . Relax in their courtyard garden complete with sandpit, goldfish pond and beach chair. They have also installed a canopy, so don’t let a bit of Bielefeld rain put you off getting your fix. 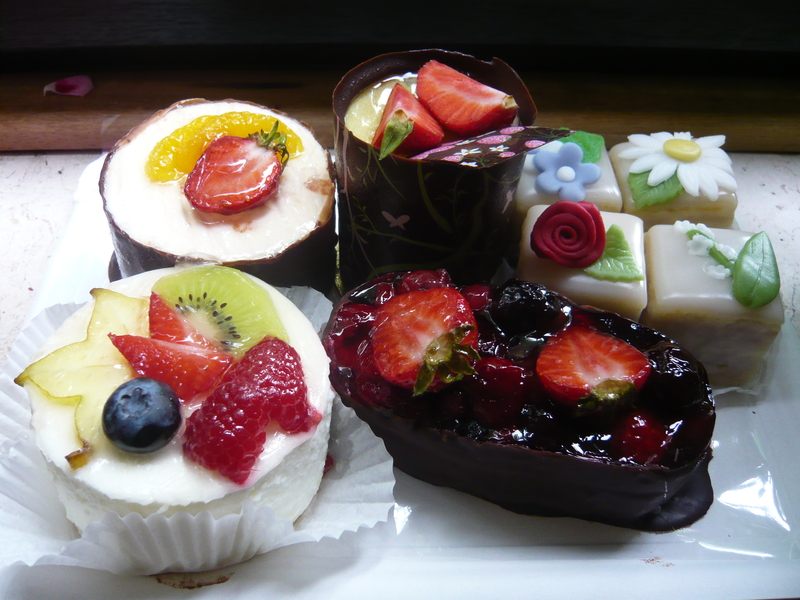 Café Passon – Run by mother and daughter team, you’ll be pinching yourself believing you must be in a dream because surely cake cannot taste this good. And the news gets better, they only use vegetable based gelatine in their cakes. 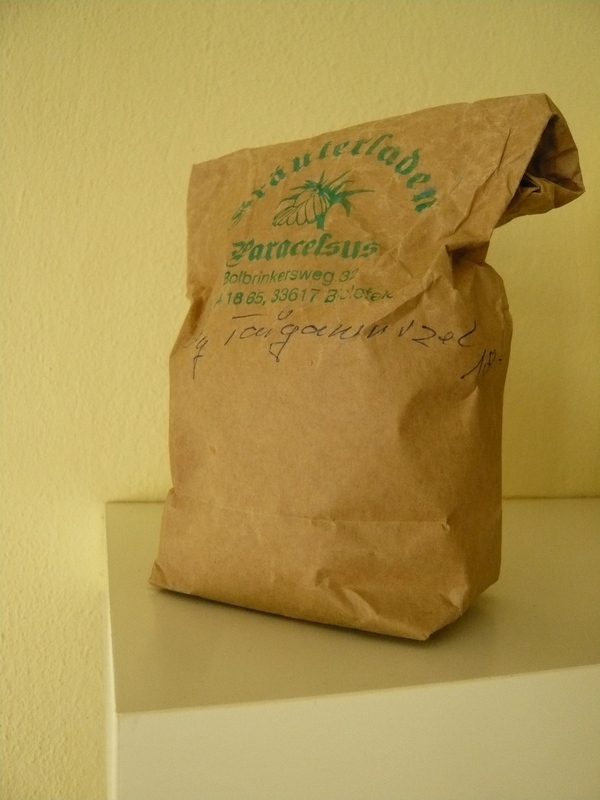 Update: Sold in July 2012 to a former trainee, and now called Cafe Gutzeit. Here’s hoping the cakes stay just as good. 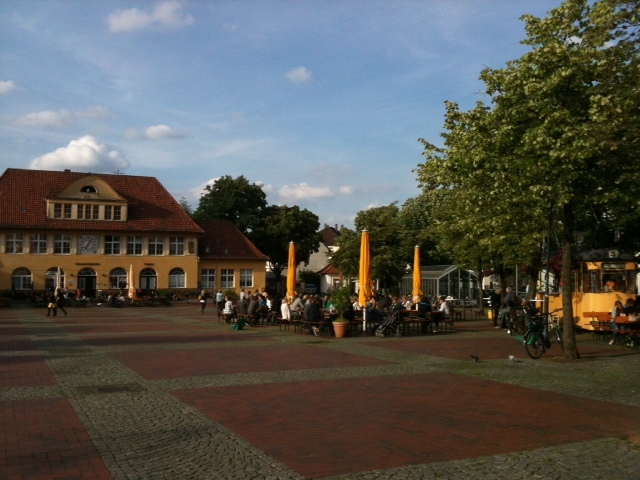 Zum Siekerfelde – This pub is on Ehlentruper Weg, just behind the City hospital. It reminds me of pubs in England, as it attracts a mixture of customers. There is a great beer garden with a playground, so it is perfect for eating out with kids. You can get good pizza here and it is not too expensive. A good place to bring the in-laws. Located in the historic centre, it specialises in home brewed beer and Fassbrause. Serves down to earth German meaty menu with food like schnitzels and steaks. Has some vegetarian options, though. A large beer garden and spacious restaurant. This is an interesting café around the corner from Brauhaus offering home-made ice cream (including vegan) and soups, all using organic ingredients. As far as I know, not licensed, but Fair Trade coffees and teas and soft drinks. 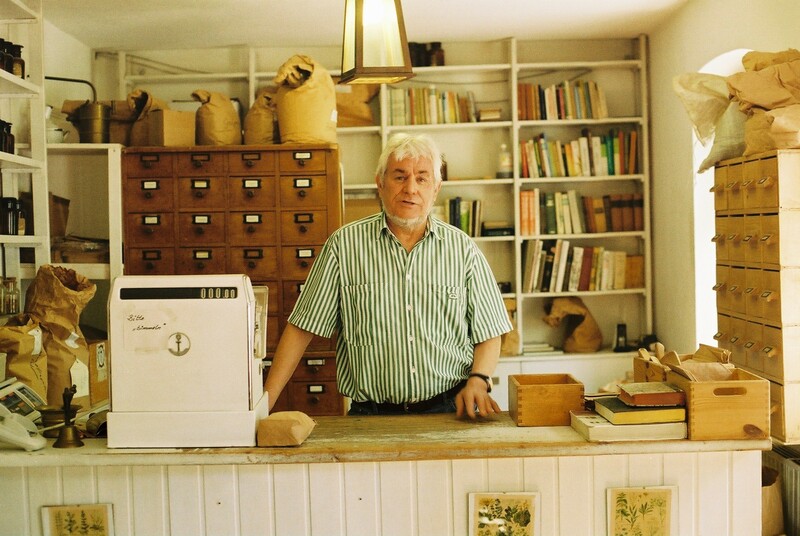 Thirty percent of profits are donated to social and environmental projects. There are exhibitions and regular events, such as yoga for kids. Self-service, you weigh the ice cream, and pay per bowl for soups. Staff very friendly. Just around the corner from Karstadt, this is a nice place to go if you are in town. Special offers at lunch-time, and a very nice courtyard garden with a Mediterranean flair. I am going to fess up here, and admit I love eating with all the old grannies and grandpas in Karstadt restaurant. Though I don’t want to think about what they put in those sauces to give them that special gloopy texture, I always find myself back there. My son once raised a few eyebrows from staff when he asked for vegetables with his kids’ meal. Ice cream without the e numbers? When the sun comes out in Bielefeld, we love to eat outdoors. We found this cafe last year up on the walking trails around Schwedenschanze ‘Sweden Hills’. 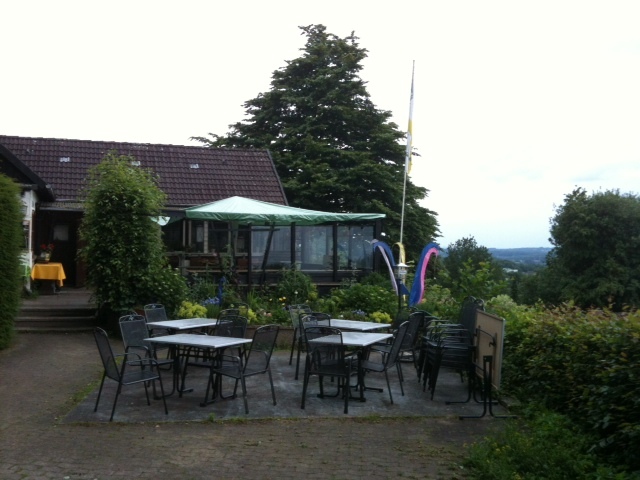 A lovely view of rolling fields and forest from their balcony terrace and they serve light meals and refreshments. A nice end to a hike, or just come for the view and to relax. English Conversation at the pub! Germans love meeting in groups to discuss their favourite hobbies, sport, anything really. They often meet in pubs at a regular table, hence the name Stammtisch. When I first came to Bielefeld I hardly knew any English speakers and I was at home all day with my son so longed for people to talk to. I heard about the English Stammtisch through the university which has been meeting regularly for over 30 years. Originally a group of students, now a small group of professionals, mostly German, who enjoy meeting to talk in English. Conversation ranges from literature, politics, culture, just about anything. They are very welcoming to newcomers and love having new people come along. I found the group to be a great support when I first moved here and happy to explain German culture to me and advice on Bielefeld. The English Stammtisch meets at 8.30 pm 7.30 pm (thanks Margarete for pointing out the time change) every Friday at the Augustus Pub, August-Bebel-Strasse 47. If the weather is warm they sit outside at the back. You can also ask the owner where to find them. The Augustus Pub is also a great pub to visit anytime. It has a nice laid back authentic feel and I hear nothing has really changed in 30 years, except for the local artwork on the walls, ( so beware the chairs have been know to fall apart under you). UPDATE: Augustus Pub has since closed and so the Stammtisch has been moving around. They are currently meeting at CORNER Mühlenstraße 2 . You can check their website here for further details and up-t0-date info. Popular with families, this lido has only been open a few years and is the only non-chlorinated swimming pool in Bielefeld. It is not only the natural filtering system that gives it its name but also the design. In fact, as you wiggle your toes in the sandy beach or sit lazily on the woody jetty, you may think you were at a real lake, rather than at a municipal pool, if it wasn’t for the blue 45-metre slide. I would describe the water as a beautiful emerald green, though my kids described it as ‘murky’. 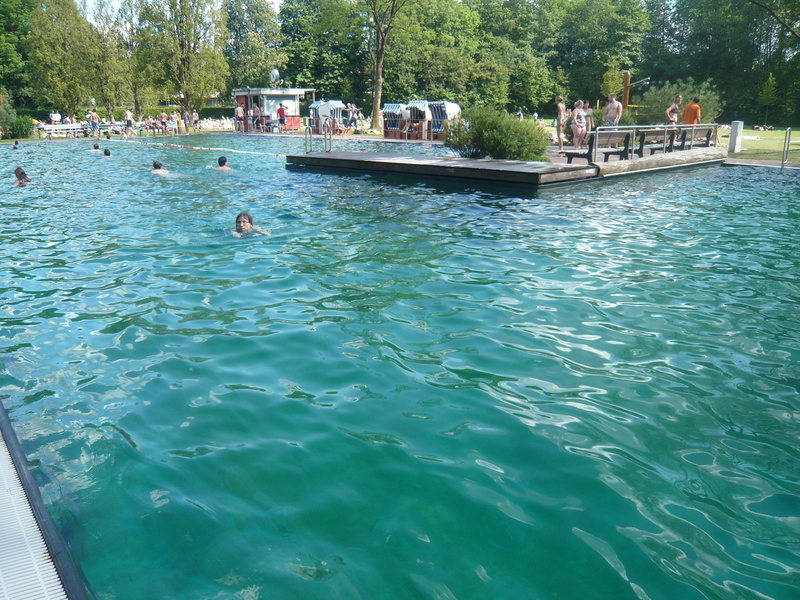 They preferred the clear, chlorinated waters of the Wiesenbad, and noticed that the water is slightly colder, 24 degrees compared to Wiesenbad’s 27 degrees. I found it much easier to supervise children of varying ages here, as they all enjoyed playing on the beach and could play by or in the same lake together. In addition to the beach area, there is also a water play and playground area for kids as well as a beach volleyball court and diving tower and a café. Most important of all, you can buy a swim nappy for a Euro for the little ones. We don’t have a car, but you can get to this pool on the Tram 1, direction Senne. Get off at Brackwede Bahnhof, and it is about a 10 – 15 minute walk from there via the railway station underpass. It is not signposted, so look it up first. 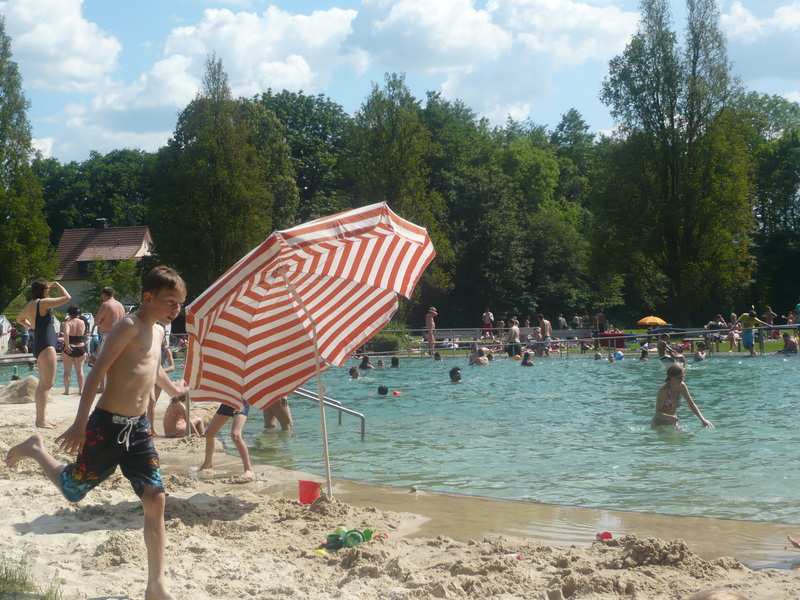 A teenagers’ paradise, and centrally located, it has the most visitors of all the lidos in Bielefeld. 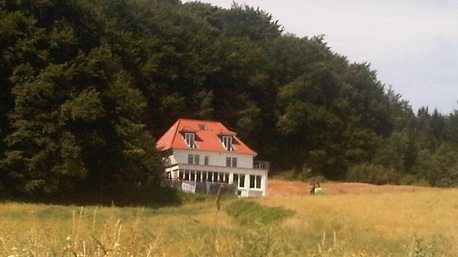 As its German name suggests, it is set in a large meadow and also has a football pitch and a beach volley-ball court. The daring attempts of kamikazi divers jumping off the 10m tower becomes a real spectator sport, which you can watch from the comfort of the Jacuzzi, if you don’t mind sharing your bubbles with ten strangers. My nieces loved the 110 metre slide, surprise sprinklers, and being swept along in the artificial current corridor. The toddler water play area is set back from the main pool, surrounded by deck chairs and a hedge, and is a safe area for the little ones to play. If you have children of varying ages, though, it makes it a bit difficult to keep an eye on them all. There is a tribune area overlooking the swimming pool giving the baths a feeling of long lost glory, the seating area scattered with bodies, presumably trying to get nearer to the sun. The restaurant area is much nicer in Naturbad Brackwede, but here you can also get some chips, hotdogs and ice creams from two stands in the grounds of the lido. Be prepared for long waits for the sinks in the bathrooms, though, as you have to contend with packs of young teenagers preening themselves in the mirror.